The Mona Lisa was painted on a wood panel and is in excellent condition four centuries later. Rigid supports such as panels protect art from accidental damage caused by flexing and cracking paint films or glue bonds, as well as protecting your work from being torn or otherwise damaged by mishandling and accidents. Our art panels provide a firm surface ideal for painting, mixed media, mounting prints & works on paper, collage OR as a rigid support for cotton canvas, linen and polyester art fabrics. 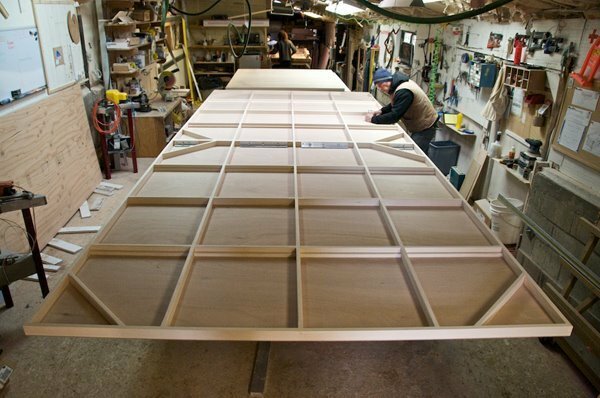 For the face of our traditional panels you have your choice of the finest marine grade mahogany or Latvian birch, evenly sanded. 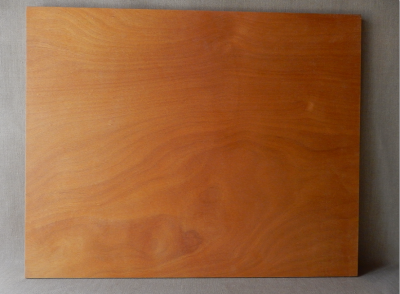 Mahogany: 4mm 3 ply okoume marine grade plywood. This beautiful wood was created for boat building; is insured by Lloyds of London for $50,000; and is manufactured in France. We consider it the best panel material available. It is rotary cut which means its a continuous piece with no splices. It's marine grade glue is very moisture resistant, and mahogany wood is naturally insect resistant. This wood has an open grain that provides a bit of texture to capture the artist's paint. 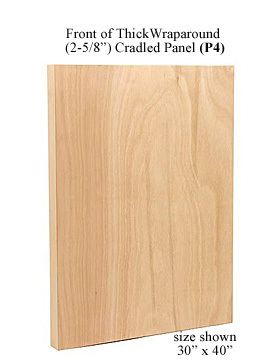 We can create a mahogany panel up to 48" x 96" with no splices, sizes larger than this will have seams. 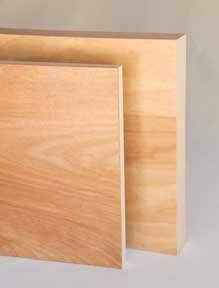 Our blonde-colored birch-faced panels are made with a Latvian birch, the best birch plywood available. We've found that red birch coming from the U.S. suppliers uses a paper-thin veneer covering other types of wood within the plywood. The 3mm thick Latvian birch plywood is a 100% birch product, a single wood-type plywood makes for a more stable product. 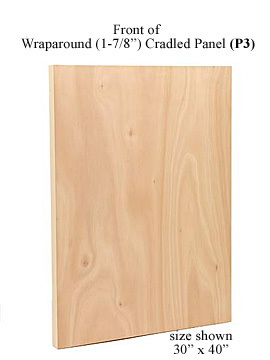 This plywood comes in the maximum size of 60" x 60". Artists can have a seamless surface for works five feet by five feet. Sizes larger than this will have seams and should be covered with a cotton canvas, linen or polyester stretched fabric for the best appearance. 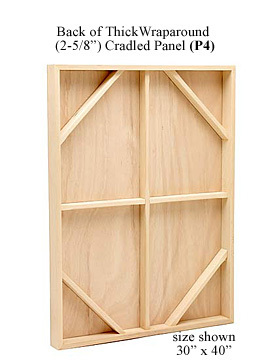 Our traditional panels have a basswood support perimeter. Additional basswood bracing is included on larger supports. For hundreds of years basswood has been used in art supports. The kiln dried basswood we use is a very lightweight hardwood, it's lighter than pine, with no knots or blemishes and no sap. This wood has a very straight, true grain which is guaranteed not to warp or twist. 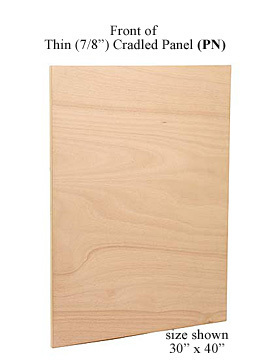 Basswood is also very close to PH neutral which is good from an art conservation stand point. 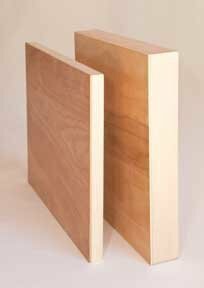 Basswood is softer than most hardwoods, which makes it easy to work with and easy to repair. 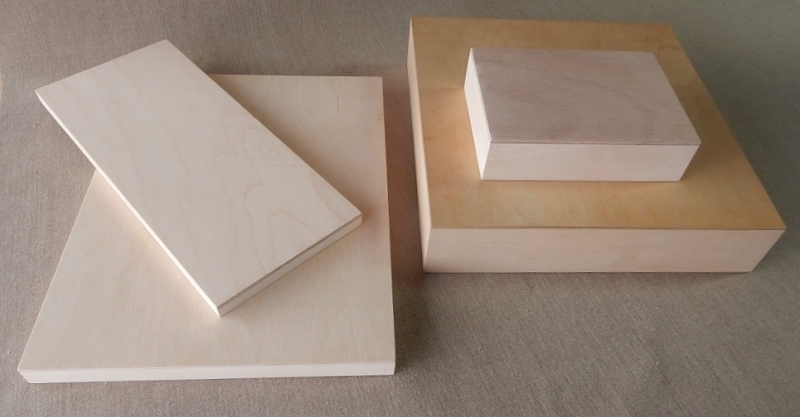 In most of Canada & the US basswood has been depleted as a viable commercial product, but John Annesley Company's long-term relationships with suppliers has secured reliable sources. Some commercial art panels available in the market use construction-grade plywood, or use scrap wood to cradle their panels. This is not moisture resistant, in the long run it won't stay straight. 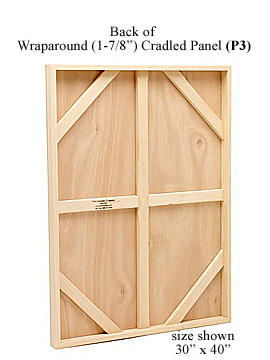 The whole idea behind adding braces to a panel is to stop the panel from warping, but cheap wood can cause warping. Plus it can make the piece extremely heavy. A few panel manufacturers use masonite, which is composed of sawdust and glue. Though inexpensive, masonite is quite heavy, easily dog-eared, swells with moisture, cracks easily, and is impossible to repair. 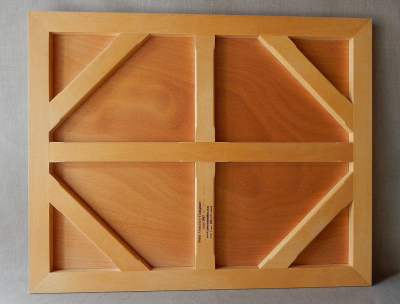 We offer our panels sealed with shellac as an option (front and back images of a sealed PN normal duty panel, 7/8" thick cradled art panel above with marine grade mahogany face). The shellac is sprayed on all sides- front, back, and edges. It creates a moisture and chemical barrier and is an inexpensive 'insurance policy' for works where paint will be applied directly to the panel, and which the artist hopes to have last for generations- which is how great art should be made. Below: Latvian birch faced panels representing two of our standard depths. 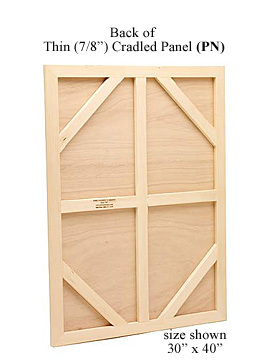 - Thin (PN)Panel with a depth of 7/8"
- Thick Wraparound (P4)Panel with a depth of 2-5/8". All are available in sizes from tiny to huge, call or email for a quote on custom sizes. We also make Plein Aire panels- marine grade plywood sealed with shellac, with no other backing or strainer, in smaller sizes up to 16x20 which can fit into our plein aire floater frames. "John Annesley's wood panels are built like a fine piece of art..."
The canvases and panels arrived today and they are BEAUTIFUL!!! OMG, they are almost too gorgeous to paint on....but I will. I'm leaving for a painting trip in the Smoke Creek Desert north of Reno. These canvases/panels will just do the trick. Thanks again. We also make large, multi-section panel systems which bolt together with perfect alignment.